CN preloads World Terrain files ... and SUA files and Waypoint/Turnpoint files for Minden. You have to load SUA and Waypoint/Turnpoint files for your geographic area. ClearNav can use STX (Soaring Turnpoint Exchange), CUP (SeeYou), and CAI (Cambridge) files for turnpoint data. The STX format is preferred as it supports all of the ClearNav display features. Pilots can usually get STX files for contests from the WW Turnpoint Exchange. They can also create STX files from scratch using Microsoft Excel, Notepad or other tools - or can convert other flat file formats to STX. The CN supplied USB Memory sticks are pre-formatted with the folders needed to support the upload and download operations. Use the CN supplied USB Memory Stick - or format your own USB Memory Stick or SD Card using the folder and file structure that follows. Must contain ClearNavUpdater.exe and ClearNavUpdater.nks files to upload Map, WP, SUA, Language and version update files. May contain log files generated by the ClearNavUpdater.exe. May contain a new ClearNav version update - CN.exe and CN.nks files - copied from the CN site - required to perform the new version installation on your ClearNav system. Downloaded flight log files will be placed in this folder. Language files are uploaded from this folder. English, German, Spanish and French language files are already pre-loaded in delivered units by CN - so this folder is typically empty. New Terrain Map Globe files can be placed here for uploading. World Globe files are already pre-loaded in delivered units by CN - so this folder is typically empty. New Terrain Map Shapefiles can be placed here for uploading. 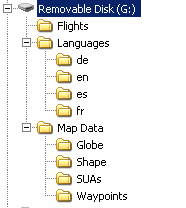 World Shape files are already pre-loaded in delivered units by CN - so this folder is typically empty. New SUA files for your area can be placed here by the pilot for uploading. New Waypoint files for your area are placed here by the pilot for uploading. The system will boot, display version information, and check security - displaying progress and status on the screen. The ClearNav application will detect the USB Stick or SD Card and will then run the Updater Program (ClearNavUpdater.exe) located in the root directory on the USB/SD device. The Updater System Update Screen will display to allow the pilot to select specific update options with the hand controller. 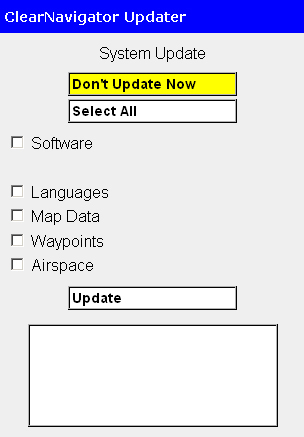 The 'Software' option is only used to upgrade the ClearNav to a new release. This option is only available if ClearNav application files(CN.exe and CN.nks) are placed on the USB Memory stick or SD Card. The default option is "Don't Update Now". Hit the controller select button to accept this option. Individually select or deselect each option: Languages, Map Data, Waypoints, Airspace - then highlight and select the "Update" command to initiate the update. 'Software' will update your device using the CN.exe and CN.nks files. The other options will copy the appropriative files from the USB /SD device to solid state storage on the CN unit. These files then have to be loaded using a setup menu function. File uploads are only allowed during the power up cycle - you may download files to a USB Memory stick or SD card at any time. Supply Power for SIM operation at your desk using the Portable Power Connector (0652).